Teachers.Net is proud to support Pat Cunningham, Cheryl Sigmon), and their colleagues in the research and development of the 4 Blocks method. Join our community of teachers across the country working with 4 Blocks every day. Visit and contribute to the 4 Blocks and Building Blocks chatboards, and subscribe to a Four Blocks Mailring. It's like having the foremost authorities in 4 Blocks teaching right next door! Around the Block With the California Chatters! 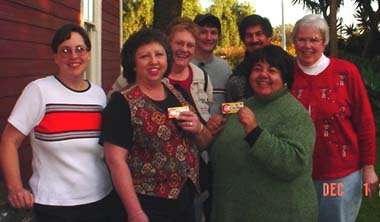 In April of 2001 a group of Teachers.net chatters gathered in Old Town San Diego. We had a delightful time getting to know each other! 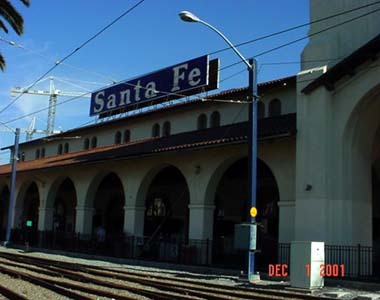 In July of that same year, a slightly larger group met in Fullerton, CA. We all had a wonderful time then, too. Since that day we've been trying to find a time to meet once again. Cher (who lives in San Diego) began the arduous task of trying to find a date that was free for most of us. She finally came up with Saturday, December 1. We again met in Old Town. 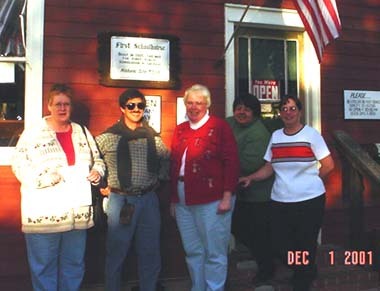 The weather was beautiful and we all had a great time meeting old friends and making some new ones. I thought you'd all like to see the pictures that were taken that day. 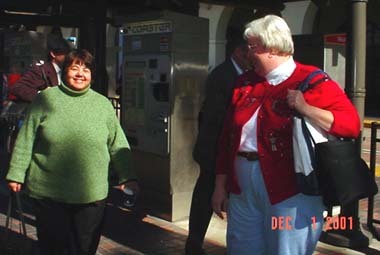 Aggie and Sylvia took the train to San Diego from Orange County, CA. This is a beautiful 2 hour trip along the coast. 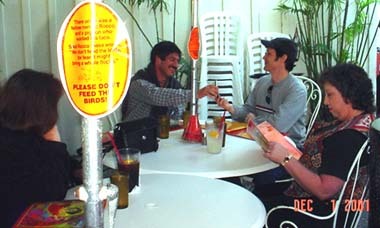 We all met at about 12:30 at Casa de Bandini in Old Town San Diego. This is a large Mexican restaurant in a converted Hacienda. We had drinks and a delicious lunch on the patio. 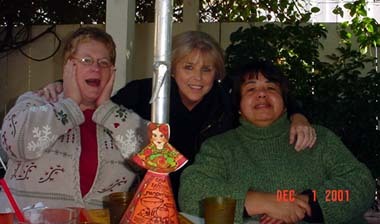 One of the new chatters we met was Cin who flew in specially for this event from Phoenix, Arizona! She is a hoot and a half and added a lot of fun to the group. We also met our fearless leader-Mr. Teachers.Net himself--- Bob Reap. 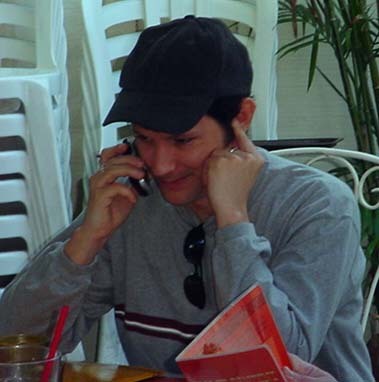 Here he is talking to Soli (who was unable to be there this day and was sorely missed!) on the cell phone. If you frequent the chat room here at Teachers.Net at all, you've probably heard about aggie's "chat attire". 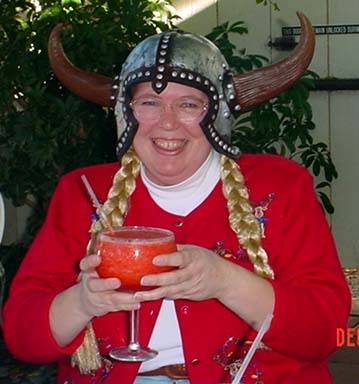 To tell you the truth, I no longer have any idea why or how this got started but the rumor is that aggie/1/ca chats while wearing a kilt, coconut bra, hiking boots and, to top it all off, a Viking helmet. I've started collecting these things now. 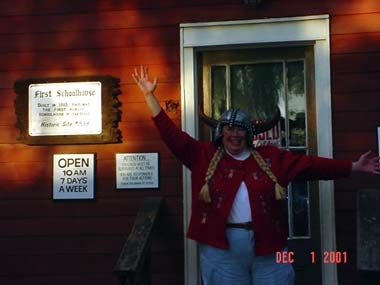 At Halloween I found a terrific Viking helmet--- I knew I'd have to wear it for the next Teachers.Net gathering! Here is a picture of me in the famous helmet at lunch and in front of the school in Old Town. Since we are all teachers, many pictures had to be taken of us at the school. Here we all are inside�looking a lot more like those children who give us gray hairs when we have them in our classrooms. 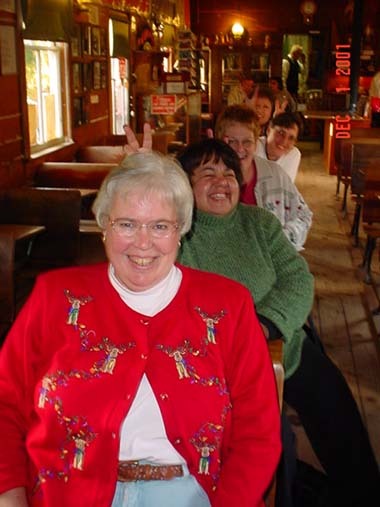 I'm in the first seat, then Sylvia, Cin, Sandy and Tabasco Queen. Outside the school we took some group shots of all of us. It was a great day for all of us! There was lots of laughing, sharing, gossip and jokes. If you've never gone to a Teachers.Net gathering please do consider it! While it's fun to chat here in the cyber world, it's even better to put faces and personalities to names!